July 04, 2017 (LBO) – A Japanese business delegation has requested that Sri Lanka’s finance minister gives them at least six months notice prior to the enforcement of tax amendments, as it might have an adverse impact on exports. The request came during a meeting held at the Finance Ministry on Monday attended by the Japanese Ambassador to Sri Lanka Kenichi Suganuma and Finance Minister Mangala Samaraweera. The Japanese delegation apprised the ministry of issues faced by investors with regard to various tax reforms implemented from time to time, the finance ministry said in a statement. They stated that most of their products are exported under forward contracts with buyers and any sudden amendment to the tax regime may affect their exports. Finance Minister Samaraweera stated that since Sri Lanka intends to implement an investor and export friendly economic policy, the Government would implement tax reforms favourable to exporters. 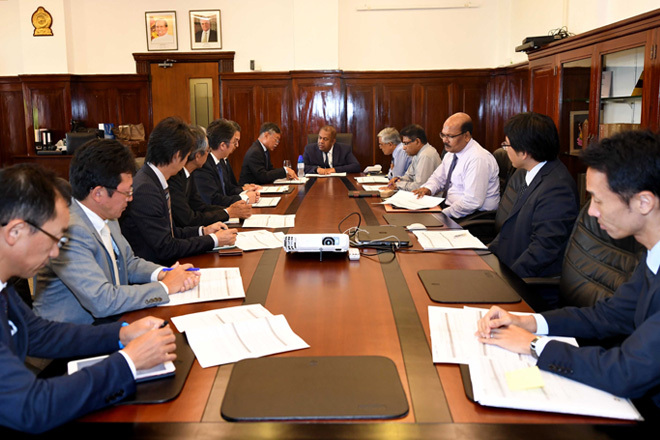 The delegation of representatives from the Japanese Chamber of Commerce & Industry in Sri Lanka also briefed the minister on various investment projects undertaken by them in the country and exchanged views on ease of doing business in Sri Lanka. The Japanese Ambassador was accompanied by a high-profile business delegation consisting of the Chairman/President of Training and Service Industry Group of Mitsubishi Corporation Eiji Suga, Vice Chairman of Taisei Corporation Hiroki Horikawa. Vice Chairman of Noritake Lanka Porcelain Yoshinari Shimaya, Vice President of Itochu Corporation Akira Matsui, Vice President of Oriental Consultants Noboru Kitazawa, Vice President of YKK Lanka Ryuhei Nagahata and Secretary General of the Japan External Trade Organisation (JETRO) Kazuhiko Obama were also present.